The Philadelphia Eagles find themselves at the bottom of one of the weakest divisions in the National Football League through four regular season games, after losing to the Washington Professional Football Team to fall to 1-3. As if losing on a last minute touchdown from Kirk Cousins to Pierre Garcon wasn’t bad enough, one of the Eagles biggest offseason acquisitions made his opinion known after the game. As Fox Sports noted, Murray through four games last year had 99 carries for 534 yards. This year he has carried the ball 29 times for less than 50 yards. I agree Murray should get more carries as clearly the most talented back on this team, but I also think Murray has to do more with the carries he is getting before saying something publicly. Zach Berman covers the Eagles for the Philadelphia Inquirer, and has had a series of tweets of the past 24 hours from players, as well as Head Coach Chip Kelly, that tell the story of this team better than I ever could. Chip cites the ’13 Eagles that started 1-3. …They were also 3-5 at midway point. Finished 7-1 in back half, won division. I doubt anyone would expect Kelly to be anything but optimistic that HIS team can turn things around, saying for the fourth straight week the team needs to execute better. While I think any coach would say this to the media the day after his team fell to 1-3, I also think Kelly truly believes this team can turn things around this season. While the Eagles have clearly hit rock bottom, one bright spot that should not go without being mentioned is the way Sam Bradford looked against Washington. Sure, Washington is not of the best defenses in the league, but they are middle of the pack and have some talented players on that side of the ball. C’mon, let me have this one little bit of hope. I still like their chances in a division they only find themselves one game out of first place. Yes, the New York Football Giants looked good this week, and are the only team that scares me. Hear that? That’s Cowboys fans losing their mind at what I just said. IF Tony Romo and Dez Bryant return, the Cowboys have a legit shot to win x-number of games in a row and take back control of the NFC East. Heck, any team that wins three consecutive games in this division will find themselves in first place. The problem, Cowboys fans, is there’s a slim chance either Romo or Bryant return for any significant amount of time this season. I just saw an SB Nation NFL tweet saying Dez could be back Week 7. Cowboy fans should cringe at that thought. Rushing back a player off of this type of foot injury could lead to Dez missing the rest of the season if he re-injures it – see 2014-15 Kevin Durant. As for Romo, he has been one hit away from being out of the league for a couple years now between his back and shoulder. When he returns, and especially if he is rushed back and not 100-percent healthy, the chances are again slim he makes it through games against the blitz-happy New York Jets and Buffalo Bills in back-to-back weeks. As I was saying, the Giants pose the biggest threat to run away with this division. I see the Eagles look a little better each week, and believe a team with this much talent on their roster will find a way to win enough football games to be in contention for a playoff spot come December. 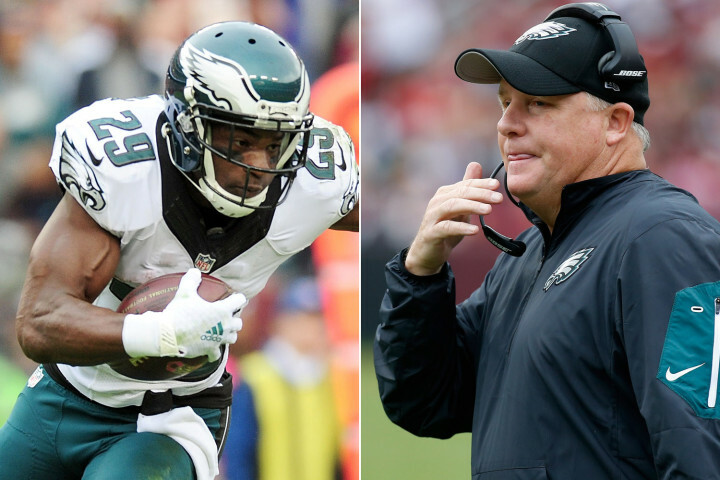 I heard this last thing on the radio about the mess in Philadelphia and had to address it: for anyone to say Chip Kelly is on a short leash and should be considered to be replaced is absolutely crazy. I say that because this team – with his hand-picked players on it – would be worse with literally anyone else as the coach. There will come a point and time if this keeps up that the Eagles should decide to move on from Kelly, but midseason during his third year in charge is definitely not the right time. Well that was therapeutic. Just remember, Eagles fans, none of this is a story if they are winning. DeMarco isn’t talking about touches, and the media isn’t acting like the sky is falling. The sky is not falling in Philadelphia. We are four weeks into a very long season. I do know that sky is supposed to be sunny and, at best, it’s currently overcast. I would just like to think the sun has yet to break through and will one day shine very bright before this season is over. This entry was posted in Home, NFL and tagged 2015 NFL Season, Chip Kelly, Dallas Cowboys, DeMarco Murray, Dez Bryant, New York Giants, NFC East, NFL, Philadelphia Eagles, Philadelphia Inquirer, SB Nation, Sunny in Philadelphia, Tony Romo, Zach Berman. Bookmark the permalink.